I added a double crossover switch to the layout plan and I like the look of it on paper. It allows for more flexibility in switching out of the classification yard and provides through traffic for either direction and for either the inner or outer main line loops. 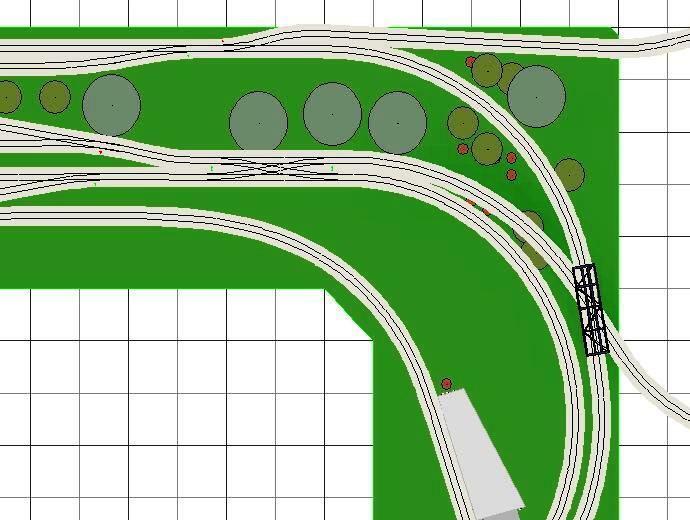 The new design will necessitate the requirement to cut some of the existing track and a switch as well, but should not be too much trouble. This plan seems to correlate with prototype track schemes and for appearance sake will add an element that is currently missing on the layout. The hard part now is to find an in stock item for a #6 Code 83 HO nickel silver double crossover switch. An email to Kim at Train Buddy is pending a reply at this time. As you can see from the image above (click image for a larger view) the double crossover will allow dispatchers to route through traffic on either side of the double crossover allowing for both east/west bound and incoming/outgoing traffic activity. This also gives the classification yard switcher more opportunity to make up consists and avoid fouling the main line. I think it makes more sense that way, Space Mouse (aka Chip) made the suggestion in another post and I like the way it looks more prototypical!